We are proud to announce that Mr. Lokesh Poddar's (FMS-IRM PGDM-RM - III Sem.) 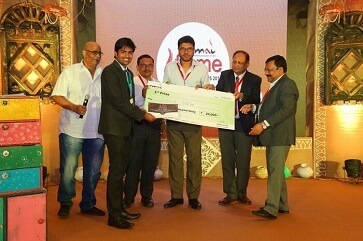 project 'Exploratory research on farmers satisfaction & preference of Bayer Pearl millet Hybrid 9444 seeds in villages of Barmer District ' has made it to the top 3 of the '12th Annual RMAI (Rural Marketing Association of India) Student Flame Awards for best Summer Projects In Rural. Institute of Rural Management, Jaipur is a well-established institute in the field of management education, training and research. It has been rated A+++ among India’s top B-Schools and ranked 1st among top B-Schools of Rajasthan by ICMR-GMRCO. With immense pleasure, we announce the " 16th Annual National Level Summer Project Presentation Competition SPARDHA -2018" on 26th and 27th October 2018. 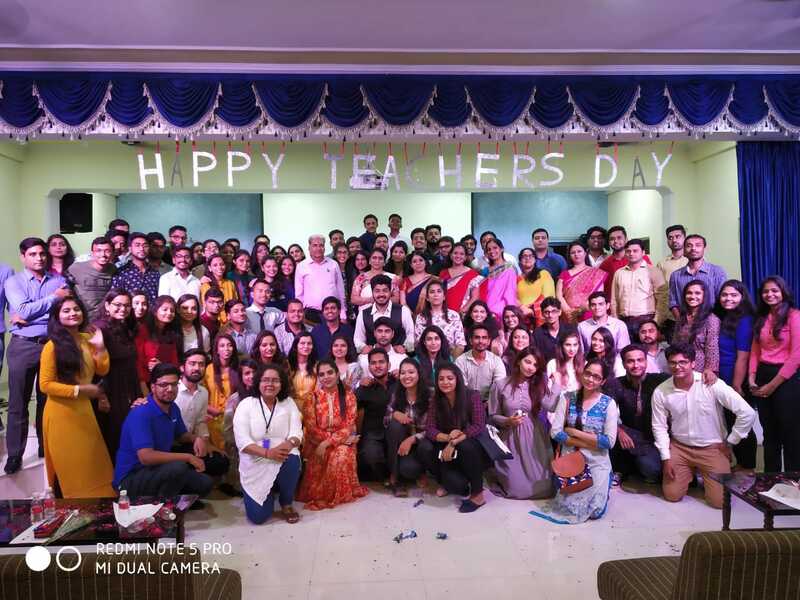 In the last 15 years the event has provided a platform for budding managers to present their learning assimilated in the course of their Summer Internship about the techniques, opportunities and novel strategies of the business world. 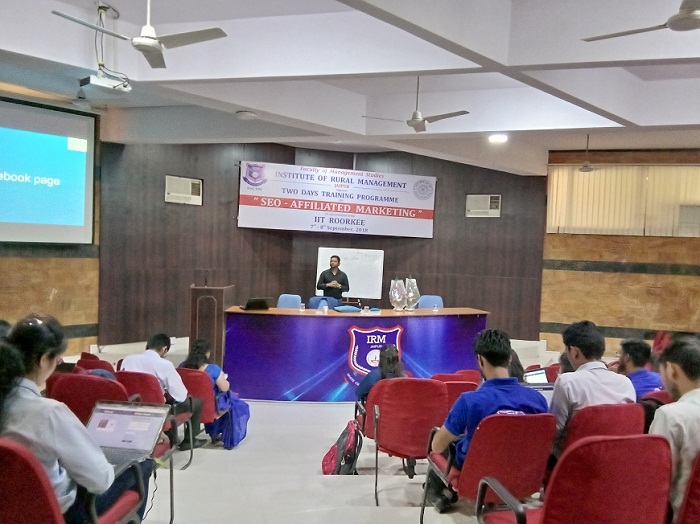 “SPARDHA-2018” will be an arena for young managers to illuminate their research-based knowledge and to reciprocate with specialist of corporate world and contemporaries from various reputed B-Schools. 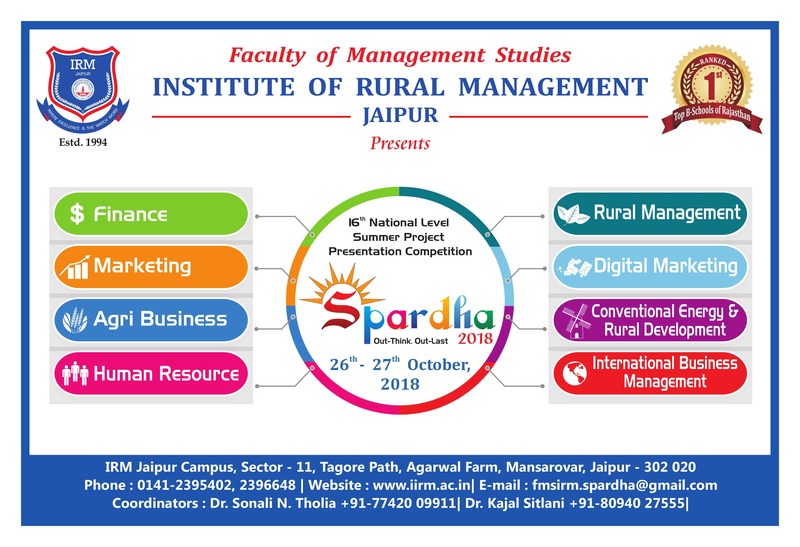 FMS-IRM calls upon young managers from B-Schools of repute to participate and showcase their intellectual capital and analytical skills in “SPARDHA - 2018”. The students who are pursuing their Third Semester/ 2 year MBA/PGDM-BM/RM/PGPBA programs (completed their SIP) are eligible to participate. Motivational incentives in terms of Cash awards and Prizes will be awarded to the best students in each stream for exhibiting their comprehensive, analytical and innovative skills during the event. Being member institutions, committed for the development of young managers, we should create more and more opportunities for the students to exhibit their learning and these innovative business learnings interaction become a practical reality. With this objective, we foresee maximum participation of students from your esteemed organization. Therefore, we request you to encourage your students to participate in this innovative event “Spardha-2018”. Looking forward for an earlier response. Thought Leadership Lecture Award - 2018 was organised in remembrance of Founder President Dr. Thomas Cangan on his 12th Punyatithi at Deepsmiriti Auditorium, Mansarovar, Jaipur. Award was presented to Dr. Tessy Thomas, Director General Aeronautical Systems & the former Project Director for Agni-IV Missile in Defence Research & Development Organisation. She is known as the 'Missile Woman' of India by Mr. Stany Thomas Cangan. FMS-IRM organizes Thought Leadership Lecture series with the participation of top notch business leaders and social thinkers for the benefit of its young managers. This would help the managers- in- making to upscale their thinking and perspectives on business and development sectors and to reach out to a global canvas. As a sign of its social commitment and new age thinking, in the year 2012, FMS-IRM has instituted a Global Business Leadership award in the name of its founder Dr. Thomas Cangan. Onam, the biggest and the most important harvest festival of Kerela was celebrated by the students of FMS-IRM on September 04,2017 with full zeal and zest. 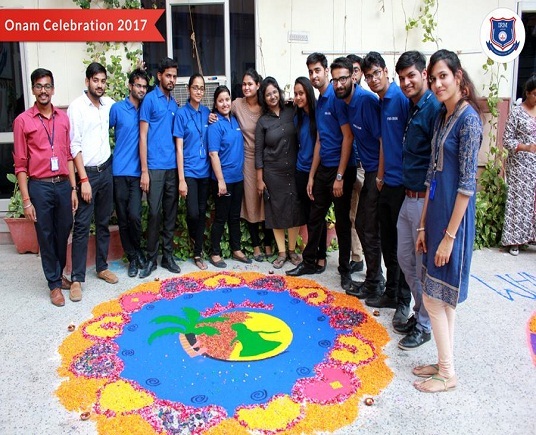 An intra college Rangoli Making competition was organized in the amphitheatre where in students of Semester I and Semester III got together and took active participation and made a variety of traditional decorations. Prof.Barbara Cangan, President, SIIRM, judged all the rangolis’ and appreciated the students for their efforts. The team from PGDM-BM, Semester I bagged the first place in the competition and team from PGDM –RM, Semester III was the first runner up of the event.